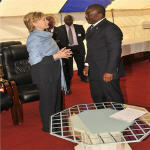 U.S. Secretary of State Hillary Clinton wrapped up her 11-day, seven-nation African tour on Thursday without announcing sincere and pragmatic actions to promote African development except promising financial aid to very few countries she visited. 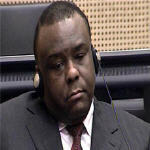 Pre-Trial Chamber II of the International Criminal Court decided to grant the request of Jean-Pierre Bemba Gombo for interim release, albeit under conditions. The implementation of this decision is deferred pending a determination in which State Jean-Pierre Bemba Gombo will be released and which set of conditions shall be imposed. The Democratic Republic of Congo is defending a $9 billion mineral deal with China that is holding up a major international agreement aimed at reducing the DRC's external debt. China's biggest investment deal in Africa would give state-owned firms the right to develop Congolese copper and cobalt mines in exchange for building roads, railways, hydroelectric dams, universities, airports and hospitals. 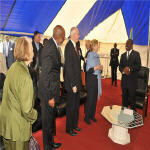 The president of the World Bank, Robert B. Zoellick, met with President Joseph Kabila for an hour on Tuesday in Goma (North Kivu province). 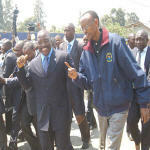 They reviewed the economic issues affecting the DRC amidst the global fincancial crisis. 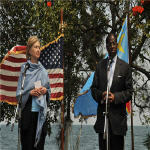 The tense moment happened as Clinton spoke to students at a Congolese university in Kinshasa. A male student rose to ask a question about Chinese financial contracts in his country. The student asked Clinton what President Obama would think of the deal, but pool reporters in the room said the translator made a mistake and asked what Bill Clinton would think. "We know that the promise of the D.R.C. is limitless. We will help you build a strong, civilian-lead government that is accountable and transparent, an independent judiciary, a professional military that respects human rights, a free press, and an active and engaged citizenry. 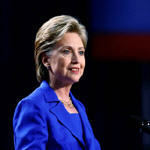 A society whose institutions respect the rule of law," she said. Well, it’s interesting because I’m aware of the commitment that China has made, and I think that building roads is a very important development goal for this country. But so is good governance. 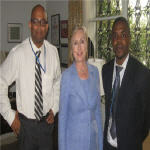 So is protecting and promoting human rights. So is building an independent judiciary, a free press, the institutions of democracy that will hold up over time. It’s important to build a free market, to stand against corruption, to ask for more transparency, and the United States has been working to achieve those goals. 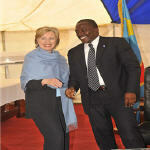 US Secretary of State Hillary Clinton has arrived in the Democratic Republic of Congo, where she will speak out on the country's deadly civil conflict.